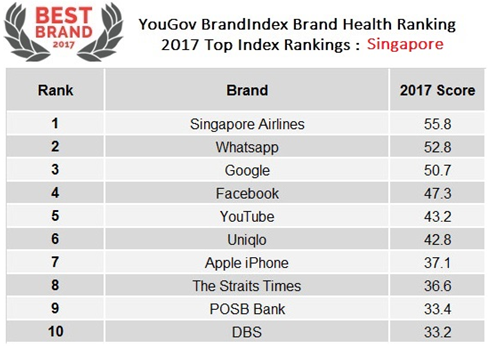 Four local brands – Singapore Airlines, The Straits Times, POSB Bank and DBS – have been ranked among the top 10 in YouGov BrandIndex’s inaugural global brand health rankings. The Index score, which evaluates overall brand health, is used for the list and takes into account perceptions of a brand’s quality, reputation, satisfaction, impression, value and whether consumers would recommend the brand to others. 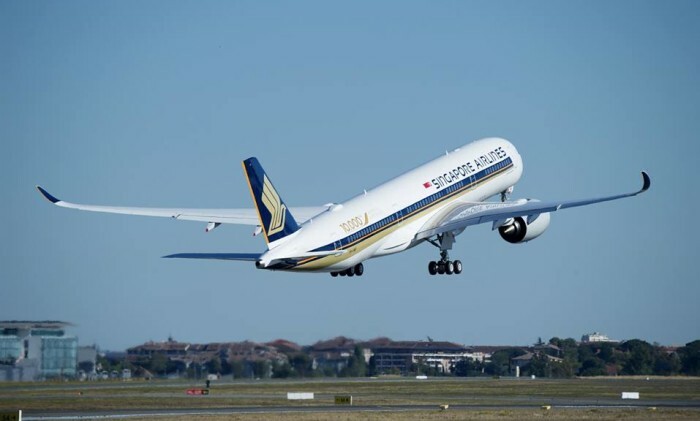 Singapore Airlines topped the ranking with an Index score of 55.8, while The Straits Times, POSB and DBS had a score of 36.6, 33.4 and 33.2 respectively. Whatsapp (52.8), Google (50.7), Facebook (47.3) and YouTube (43.2) were among the top five. According to Ervin Ha, YouGov’s head of data products, Asia Pacific, Singapore Airlines has dominated the list year on year despite “turbulent times” because consumers continuously “think highly” of the airline. Ha added that the other local brands rank highly due to the trust consumers have in Singapore-made brands. As for Uniqlo, he noted that it was due to the company offering “great quality and fashionable clothes at affordable prices” which draws consumers. Google came out on top in global brand health rankings, with YouTube, Facebook, Samsung and Whatsapp ranked among the top five. Ted Marzilli, CEO of YouGov Data Products, said tech brands such as Google, YouTube and Facebook dominate the list because they are “open and accessible” in most areas worldwide to anybody with Internet access. “The presence of Samsung and Apple iPhone demonstrate are a sign that our mobile devices have become the remote controls for our lives. All of the brands in the ranking are mainstream with broad utility at their core – and this is as true of the likes of Toyota and Colgate as it is for WhatsApp and Samsung,” he added. 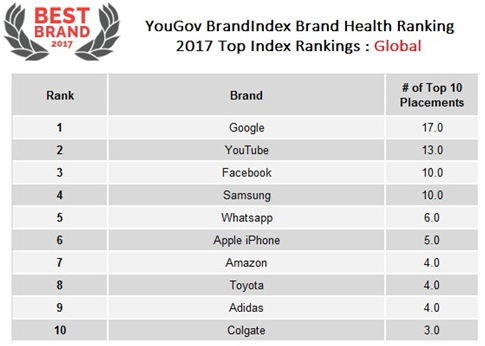 YouGov also released a list of top 10 brands with the most improved brand health over the past year, with Lazada as the top brand that jumped from a score of 8.0 in 2016 and 15.0 in 2017. Ranked second, Oppo’s brand health ranking score improved from 0.2 this year to 6.0, while Huawei, which was ranked third, jumped from a score of -5.6 in 2016 to 0.3 in 2017. Local brands such as BreadTalk (#4) and Redmart (#10) also made the list, with a score of 7.4 and 9.9 respectively. “Lazada has been improving their score in not just Singapore but also around the region, having shown up in multiple countries as a top improver. They’ve done well compared with the heated competition and we look forward to having them improve year on year,” Ha said. BrandIndex runs in 32 countries worldwide, covering markets such as Asia, Australia and North America. The list shows the brands with the highest average Index scores between 1 July 2016 and 30 June 2017. Advertising technology company BlisMedia has hired Harry Dewhirst to its executive team and board of directors. ..
Great Eastern has appointed Clement Lim as head of group digital marketing, replacing Veronique Cornu Meffert who is now at METLif..
It’s time for brands to spend more time getting to know what drives their audience, otherwise, they may well end up being irreleva..
Shiseido has embarked on a major global rebranding to reflect its global ambitions, putting a new brand value "empathy" in the for..